Ionian Sea, one of the most noticeable features of this port of call is the black-grey volcanic stone, nearly ubiquitous in pavements and buildings, and yet another symbol of the city's triumph over it's fiery nemesis. Greco-Roman-philes will delight in a diverse array of archeological sites such as the Odeon, Achillean Baths and the Roman Amphitheatre; while those preferring the Baroque will be drawn to Catania's UNESCO World Heritage city center with such churches as Saint Francis of Assisi at the Immaculate and the Basilica della Collegiata. Be sure to visit the city's lore-riddled icon, u Liotru, an ancient stone elephant topped by an Egyptian obelisk, or marvel at the well-preserved remains of one the region's actual prehistoric dwarf elephants at the Catanian Museum of Mineralogy, Paleonthology and Vulcanology. Unfortunately, the timing of Sicily’s ideal weather is a well-known fact: this is when most tourists flood the island, driving up prices. Tourists stick around the coasts until mid-September, though you likely won’t want to; July and August temperatures can reach unbearable levels. Late fall and winter are too cool for swimming, but much quieter, and sites begin to reduce their hours; some resort hotels shut down entirely. my love, my city...food, culture and friendship...what else?! if you wanna stay here i suggest the Ostello degli Elefanti, ideal for the backbackers and low budget travellers, for whom need a good central hotel i suggest Una Palace Hotel which is in the central Etnea Street. You can visit the local fish market next to the central cathedral if you want to taste local and fresh fish, if you want to taste local food, etnea street offers the two local's best bars with Savia and Spinella which are close to each other (i personally prefer the taste of Savia's arancino). If you want to have a good dinner with local meat and at the same time a good drink i suggest FUD which is in Santa Filomena street, behind Etnea Street. These street counts also a series of places to eat and drink such as Polpetteria, U Curtigghiu and FUD (to eat), Mr Hyde, Città Vecchia and Vermut (to drink). I Santa Filomena street it is also present an indipendent library which is owned by two sisters, Libreria vicolo stretto. It is open untile 10 PM and it often hosts readings, so why don't mix a little culture before heading to dinner?!. Goin' through the local central Cathedral, you can go at the Castello Ursino, which is located in a parallel street of Garibaldi' street. You can have a drink in Gammazita, a bar that often offers live shows and djsets and which is responsible of the organisation of Ursino Buskers (which often takes place in September), the local street artists festival, in which you can find fireeaters,clowns, aerial silk artists, theatrical fictions. The Festival took place all in the area nearby the Gammazita and Ursino's Castle. One of the main cities in Sicily. Beautiful beaches around this area. Historic Center is beautiful. Restaurants are very good with cheap tasty Italian classic food. Love this place. While I prefer Palermo slightly a bit more than Catania, Catania is a very nice city and is very easy to get around. There are lots of great restaurants, the city is easy to get to by air, and there is a lot to see and do. I like the openness of the city with its many large piazzas, and the city is not too far from Etna and the beach/port. First impression of Catania was rather disappointing but it is one of those places where its charm shows up after IT gets to know you. This is a city that always seems to be busy - there's always something to do and see even if its just wandering through the streets and people watching. I visited multiple times and loved it. one of the few cities in the world where is possible go from the mountain to the sea in 30 minutes. I've lived in Catania since October 2009, and am constantly discovering new things to love about it. No, it's not the most beautiful city in the world, but it's less touristy than Taormina and Ortigia, which means that there are more people living there 100% of the time. This means that there are supermarkets, day-to-day shops and proper local bars rather than simply overpriced places aimed at people who are only going to be there for a week. 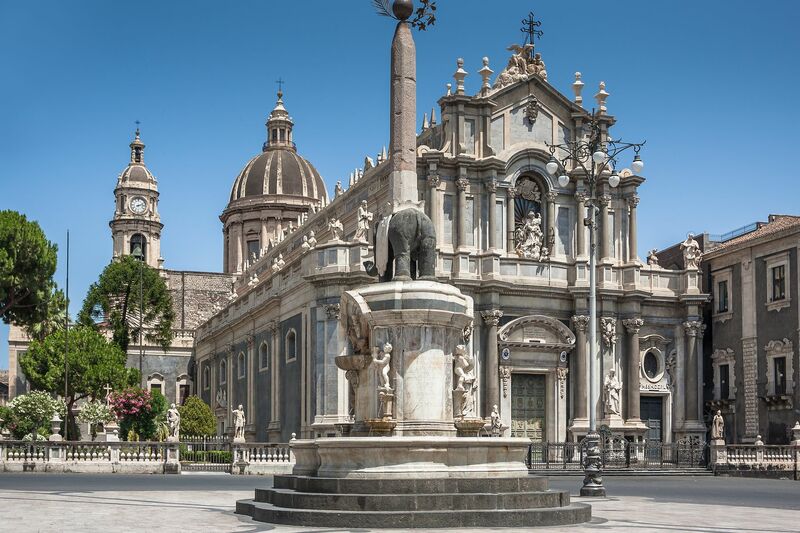 If you want to settle in somewhere for a little while and actually get to know it, then Catania is a great place to do it. It's busy and chaotic, but you'll never once get the chance to be bored. I had planeed just to sleep over before my flight, and was amazed by this photogenic city. Il Padrino shots took place at its many churches. Very nice! I went for shoping there its nice.